The catalogue is the first step towards a systematic description of the manuscripts of the Wycliffite Bible, one of the most influential medieval English works. The Bible is the first complete translation of the Vulgate in English, produced at the end of the 14th century by the followers of the Oxford theologian John Wyclif. In spite of being condemned and banned within twenty five years of its appearance, it became the most widely disseminated medieval English text. 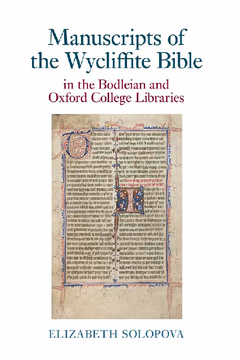 The catalogue contains detailed descriptions of all (64 in total) manuscripts of the Wycliffite Bible in Oxford collections (the Bodleian and college libraries). This is a substantial part of the whole corpus: 250 manuscripts of the Bible survive and Oxford has the largest number of copies in any single location. The descriptions are subdivided into sections covering textual contents, decoration, dialect, physical makeup and binding of each manuscript, and are accompanied by bibliographies. The descriptions are preceded by an introduction with a discussion of the manuscript tradition of the Wycliffite Bible and the findings resulting from the study of Oxford copies. The catalogue also contains several appendices illustrating important features of the manuscripts.